Instrument changes in Sibelius are great things, and they work well — mostly. But a long-standing problem (see the Sibelius forum from 2012 and Yahoo users’ group from 2011) has been getting the key signature associated with an instrument change to display correctly in the score and part, and not break a mulitrest in the process. A couple of weeks ago, my colleague Jeremy Hughes discovered that you can hide a non-default barline in a part without hiding it in the score or other parts, By hiding the barline in the part, the multirest ignores it and is not broken by it. This led me down a path where I stumbled upon a solution to the instrument change problem. The video and accompanying transcript below explains it all. It’s not quick or simple, but it’s a solution that works, follows engraving rules correctly, and maintains the integrity of the instrument changes and key signature scheme in your score. Hi everyone, it’s Philip at NYC Music Services, back with another tutorial. This one addresses the problem in Sibelius of instrument changes, key signatures, multirests, system breaks, and Dynamic Parts. They’re all intertwined. A brief background on instrument changes. These are most often used to change the transposition of an instrument, say, from a Clarinet in A to B flat, or, to create a doubling instrument for the same player, as in this case, where the Flute player doubles on Alto Sax. An instrument change is created by going to Home > Instruments > Change. As you see, when you apply an instrument change, the short name of the instrument is updated at the beginning of the staff system, and the transposition of the notes and key reflects the new instrument. Behind the scenes, the sound of the instrument is updated as well. I’m going to hide the name of the instrument here because I’ve already placed it in the score where the music re-enters. So instrument changes are very useful, but there’s always been a problem with the way instrument changes affect system breaks and multirests. As you can see, the instrument change is breaking the multirest in an undesirable way. 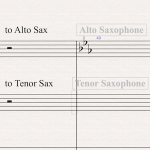 If you move the instrument change back to the previous bar, the multirest is restored but the key signature change is now misplaced — it should go after the barline, not before. Further, if there were to be a system break here, it looks strange, again because cautionary key signatures should go after the last barline in the system. The secret to getting this all to work correctly is to place a non-default barline prior to the instrument change. Sometimes you’ll get lucky and an instrument change will coincide with a double barline, but when it occurs like it does here, in the middle of ordinary music, you’ll need to place a normal barline by going to Notations > Common > Barline. It looks identical to a default barline, but it has some special properties, as we’ll soon see. On the face of it, it doesn’t look like our problem has been solved. What is needed, for whatever reason, is to take advantage of a system break in the music. If one doesn’t exist, temporarily place one in your score by hitting Return. Then drag the instrument change just to the edge of the last bar. You’ll feel it kind of stick here. Reset note spacing on the bar by Command-Shift-N or Appearance > Reset Notes > Reset Note Spacing. Sibelius has now taken the instrument change into account, and, if needed, you can delete your temporary system break. The spacing holds. Next, you’ll want to go into your part and respace the part. The beginning of the multirest H-bar is moved over by an appropriate amout to account for the instrument change, just like if it were a regular key signature change. System breaks with cautionary key signatures also appear correctly. You’ll need to reset spacing in all your other parts as well, because they will be moved out of place. There’s also one final, crucial part of this process. The special normal barline breaks a multirest in other parts where the music would otherwise call for one continuous multirest. In order to restore this multirest, you’ll need to hide the barline in the part. That’s right — because it’s a special barline, it can be hidden in some parts and shown in others as well as the score. By hiding the barline, the full multirest is restored. Certainly this is a case of something that should work more easily, and if you use Finale, you’ll know that instrument changes (and their older relative, Staff Styles) handle this situation flawlessly without any workarounds. But for now, in Sibelius, even though the workaround is complicated, at least you know all the steps in order to get everything to both look and work correctly in your score. Woo-hoo! That is some virtuosic Sibelius-ing. Congratulations to you and Jeremy for working this out. It is good to finally have a legitimate use for a “special normal bar line” as they are usually much more of a problem than a solution. This must be the geekiest work-around ever documented for a Sibelius problem! Thanks a lot Philip for this work around! How do you make the little bar numbers appear under the multirests? Great find and workaround Jeremy! Hasn’t this “bug” been around long enough? Surely this can be fixed natively in Sibelius? There may be a way of speeding this up just a tad, by hiding the special barline in the parts after creating it, and then just showing it in the part that needs it. Chances are you’ll want it hidden in more parts than you want it showing in. So if you use ‘hide in parts’ after creating it, you’ll never need to worry about it breaking multirests in other parts. Thanks so much for this! This blog is such a great source. THANK YOU. Thank you. This has been the source of such aggravation, especially in theater music. You must let me buy you a few drinks for this one! Oh: Neil is correct. You can actually just hide it altogether in the score and the effect will be preserved. Excellent, I’m glad you enjoyed, this, Matthew! And thanks to Neil for optimizing the process further. Ingenious workaround for a problem that shouldn’t be there in the first place. Thank you! Thanks for posting this. I have a similar situation. What if you want the new key signature to be at the beginning of a new system? I feel the new key signature for a new instrument should be right at the point where the instrument first plays. I’ve used your technique in the video to get most of the way there but now the measure before the new instrument is splitting a multirest. Thoughts? I join Marc’s question – I am experiencing the exact same problem. The workaround is fantastic to prevent split multi-rests after an instrument change, but what about before? 1. Apply the instrument change as demonstrated in my video/post. FAB. This has been a problem FOR EVER and now sorted out. Thank you! Excellent! Yes, I’ve used it on many occasions.